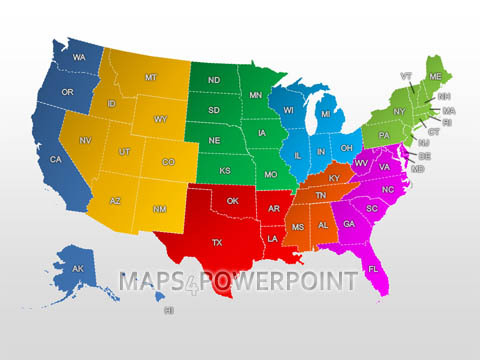 Maps4PowerPoint offers you an easy way to embed an editable U.S. map into your PowerPoint presentation. Not only does this infographic map make your presentation look classy, it also provides nice opportunities - from creating a distributor network map, or a sales map, or a slide of local stores to geographic demonstrations and visual comparison of different regions. The United States template for PowerPoint is easily customizable and fits any design or presentation layout. Plus it is very simple to embed and doesn't require any technical knowledge. We are the copyright holder of the Product. The Product or any portion of it is the subject to international copyright treaties and is protected by copyright laws. Any activity that infringes terms of this Agreement violates copyright law and will be prosecuted according to the current law. We reserve the right to revoke the license of any user have infringed the terms of this Agreement. You may not use the Product or any part of it entirely or as a part of any other software or product or website without our written permission. You may not give, sell, distribute, sub-license, rent, lease or lend any portion of the Product or Documentation to anyone. You may not place the Products on a server so that it is accessible via a public network such as the Internet for distribution purposes. We will not be liable for any damages (including any loss of profits/saving, or incidental or consequential) caused to you, your information and your business arising out of the use or inability to use this Product. We are not liable for prosecution arising from use of the Products against law or for any illegal use. If you fail to use the Product in accordance with the terms and conditions of this License Agreement, it constitutes a breach of the agreement, and your license to use the program is revoked. License agreement remains effective until terminated. We reserve the right to terminate your license to use the Product at any time, if in its sole discretion, you are not abiding by the terms of the Agreement, including, but not limited to, obscuring or removing any link or copyright notice as specified in this agreement. You may terminate it at any time by destroying all copies of the Product. Termination of this Agreement does not bind us to return you the amount spent for purchase of the Product. If you continue to use the Product after we give you notice of termination of your license, you hereby agree to accept an injunction to enjoin you from its further use and to pay all costs (including but not limited to reasonable attorney fees) to enforce our revocation of your license and any damages suffered by us because of your misuse of the Product. We accept all major payment methods including credit cards and bank transfers. All payments are made in USD. You will not receive your products or services until the payment has been received successfully. If you purchase using Paypal, the money is usually transferred immediately, meaning we can ship you your products sooner than by bank/wire-transfer. Since our company offers non-tangible irrevocable digital goods we do not issue refunds for our products. By making a purchase on our site, you are confirming that you understand and agree to these terms. If there is an error with the product that renders it useless or leads to inability to use it for its designed purpose we will of course consider offering a refund. You are permitted to use PowerPoint templates for your own purposes, or for the purposes of your company. You must provide a way to prevent third parties from receiving the template in a way other than non-editable way like in jpg, png image formats or as a printed image. You can use templates both on your home and office computers. Maps4PowerPoint was one of my best findings in 2011. I used to draw maps for my presentations myself or hire a designer each time, but that was costly or time consuming (or both). 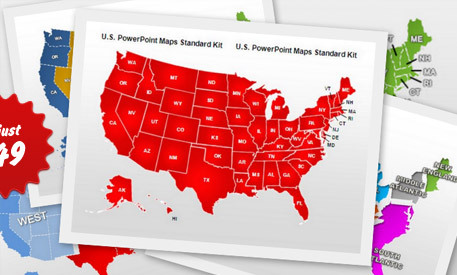 Now I can put any U.S. map I need - a whole map or a county-focused one - into PowerPoint presentations in a minute. Thank you! At first I was skeptical about how well a third-party map will blend into the specific layout of our company's presentation. Turned out I was too cautious. All worked fine, the map installs easy, and embedding it into a PowerPoint presentation was no issue either. Great product, thank you. © 2014 Maps4Powerpoint.com. All rights reserved. PowerPoint are trademarks or registered trademarks of Microsoft Corporation in the United States and/or other countries.